So first, let's talk about book shelves. There are as many different ways to use and style one, as there are personality types. I prefer mine to have a mix of both functional AND pretty, thus you'll not see me flipping my books backward so that I can't read the titles. (Though it's so pretty in photos.) 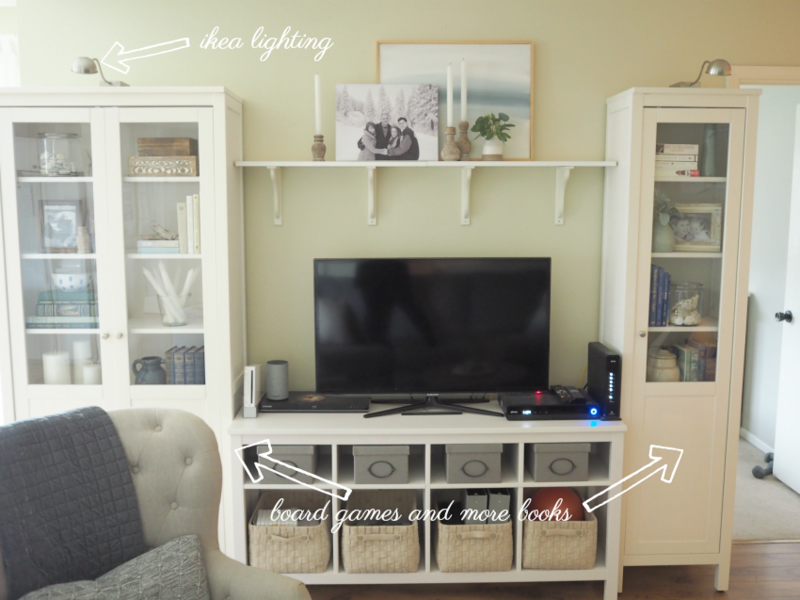 Today, I'm sharing my shelves and how I refreshed them just a bit, lightened them up and edited a few items out to either the donate bin (hello paperbacks that I'll never re-read) or other spaces in our home. Simple images draw me in and whisper calm to me and I'm working more and more to create that overwhelming feeling in my own home and spaces. Often, a quick edit is all that is needed, but a total overhaul for fresh inspiration, is a good idea when you're really longing for change. For these shelves, I removed everything to a table and rethought it all from scratch, cleaning as I went. It took about an hour total and was well worth it. Truthfully, I edit and shed more and more material items as Adrain and I get older and continue talking about downsizing once our children head off to colleges and lives of their own. I want experiences more than stuff and I suppose that is shaping the way I am decorating (or dare I say not decorating?) more and more. Now, those of you who are wall to wall book hoarders may not even have space for anything pretty on your bookshelves. Guess what. That's okay! However, after reading this, you may find yourself wanting to edit those shelves a bit to lighten your load (especially if you'll truly never open that book ever again in your lifetime) and might be willing or able to then rethink the function+pretty idea. *Edit your books as you go, pulling them all from the shelves and asking yourself if you'll actually read or refer to it ever again. (Inexpensive paperbacks might be great to share, while classics are an obvious keeper.) Dust all your empty shelves off. *Bookend piles with objects you have gathered. *Collect and display meaningful treasures from dear places. *Shop your home, kitchen, dining area for items that aren't being used regularly, such as pretty bowls, boxes, vases, trays and pitchers for height and interest variation. *If possible, add pretty accent lighting. I like the Ikea bookshelf lighting options, and use them daily. *Stand back and think about balance and scale, and make adjustments where needed. I'll often move a pile of books or an object around a few times as the shelf takes shape. As I mentioned above, I nearly always begin projects like this, by removing everything, reevaluating, cleaning, editing and then adding back into it as needed. For this refresh, I was inspired by gathering together wood elements, my small pottery collection (including one special crock that has been in my family for years) and special vacation mementos. I am happy to answer any questions you have in comments so please do make sure to check back there if you ask anything! It can be the smallest changes that feel the biggest and are almost always worth the time. Re-thinking a space often leads to other re-thinking of other spaces, and can leave you feeling lighter and refreshed on the whole. Thank you for sharing. I have two bookshelves and they are often overwhelmingly filled. I have a hard time limiting other people's items. My family members want to display their stuff, Legos they've made, things my husband doesn't want to lose, etc. Do you have any suggestions for this? I struggle to style these and they usually are much too cluttered. I appreciate any suggestions you may have. Yes, I totally get the heaviness and weighted down thing. I feel so much better without stuff. I'm constantly purging, I don't know why I can't get it all done in one fell swoop. Your home looks so calm, lovely and relaxing. Thanks for sharing!